DC Collectibles (once upon a time DC Direct) have themselves several excellent, long running statue lines. Everyone knows Batman Black and White of course, but the DC Bombshells has been chugging along for several years now with some terrific releases. It's gotten so popular that it has transcended its original statue format, with mugs, signs, shirts, and action figures all sprouting under the same umbrella. In fact, I just saw the "Lil' Bombshells" PVC figures at the local Walmart. The concept is fairly simple: take a well known DC hero or villain, take the 40's pin up style of WWII Bomber art, and mash them together in one glorious design. The latter has morphed a bit, moving from the initial pin-up style to include other art and fashion styles of the 30's, 40's, and 50's. The latest release is Jessie Quick as the Flash. Jessie Quick is a speedster with a unique trait inheritor from her mother, Liberty Belle - super strength. She's a particularly good choice for the Bombshells line right now thanks to her inclusion in the current TV show The Flash. The statue just started shipping, and will run you around $100 depending on the retailer. The usual box with a sturdy, solid Styrofoam eggshell tray inside. It keeps the multiple piece statue all safe and sound, and it's completely collector friendly of course. There's even a small slip of paper for instructions, but no Certificate of Authenticity. I love the series, but for me they work best when the design centers on the character first and the art style second. This release is a perfect example of DCC doing it right. This is clearly a Flash character - from the style of the red and yellow costume, to the lightning bolt emblems on her shoulders, to the Flash 'speed clouds' around her standing foot, she practically screams "speedster". I also love the 50's drive-in diner concept, with the strawberry malted and "I Love Lucy" hair style. The sly wink tops it off, and with the skates in her hand, it's clear she's letting you in on her secret: she doesn't need no silly skates. The statue comes in six pieces in total: the base, designed to look like a hunk of airplane aluminum; the name plate that attaches with a magnet; the left arm, holding the tray and drink, also attached with a strong magnet at the elbow; the full body; and of course, the two individual skates. These skates have an actual string loop, which you can place over the single finger...or in the hand itself. It's cuter to put it over the extended index finger, but because I was moving the statue around quite a bit during the shoot, and because the skates themselves are polyresin, I was concerned I'd knock them off or drop them in that position. I wrapped them around the hand and fingers to ensure they'd stay - your mileage will vary. She stands about 11" tall with the base, pretty much in line with the rest of the series. While I love the sculpt and overall design, I do wish the paint operations on this release were a tad cleaner. I love the combination of the bright red with the muted yellows, and there's more than enough detail work. But certain areas, like the edges of the yellow highlights, the teeth, and the lightning symbols need to be cleaner, with sharper edges and lines. Yes, technically this statue has 'accessories'. I'm counting the skates here, since you don't HAVE to add them to her look, although I can't imagine why you wouldn't. I love the sculpt and paint work on these, with great scale and a very 'Flash-like' design. I'm just waiting for someone on social media to notice the resemblance of the double lightning bolts on the side to another infamous emblem. The use of a wash worked well here too, giving the skates an aged look without looking worn. At $100, these statues are a solid value. I would avoid going to far above that, but if you can snag any of them - especially the better in the series, like Jessie - for $100 or less, it's a solid B value. Not much. Assembly is quite simple, and the magnets are strong enough to keep things in place under normal conditions. I would take some care with the front name plate though, since it's pretty easy to bump it when moving the statue around. Not every Bombshell design wins me over, but this is one of my favorites. Perhaps it's the whole I Love Lucy vibe - I always had a thing for her. Maybe it's my love for shakes and malts. Or maybe it's simply the excellent way they combined the two themes to create a visually interesting - and recognizable - character. That's saying a lot, since I generally hate it when someone tries to take two things that are great on their own, and create the next great thing merely by combining them. Not everything is peanut butter and jelly. But DC Collectibles has managed to beat the odds with the overall series, and Jessie is another hit for me. - has her listed at $100. - has her in stock for $100. - Entertainment Earth is also at $100, and they have free shipping! 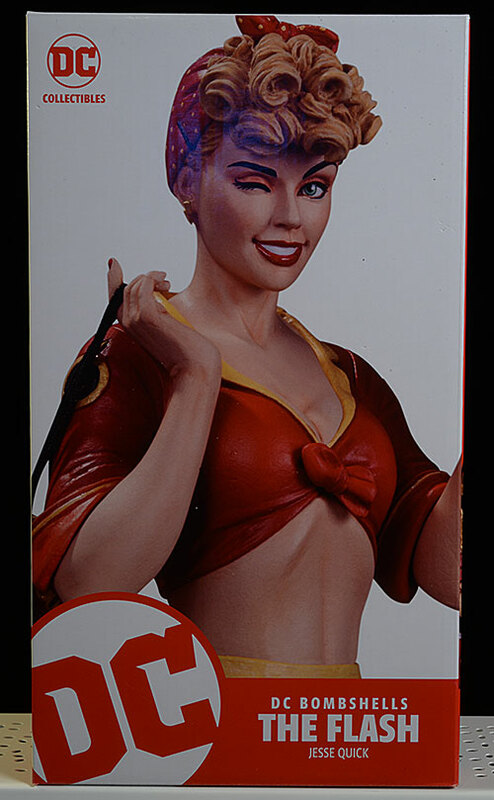 Other DC Bombshells reviews include Killer Frost, the Superman/Power Girl statue, and prior to that we had Mera, Hawkgirl, Stargirl, Black Canary, Batgirl, Harley, Poison Ivy, Supergirl and Wonder Woman.